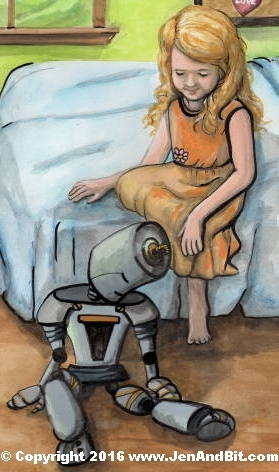 A computer is a machine that follows a step by step list of instructions. Another name for a step by step list of instructions is an algorithm. Examples of algorithms people encounter on a day to day basis are a list of items to buy at a grocery store, the instructions to assemble a bicycle, and the rules that everyone is supposed to follow when they come to a traffic light. The purpose of all computers, the reason for their existence, is to follow algorithms. Another name for the algorithm a computer follows is a computer program. 1) The monopoly squares are analogous to computer memory. 2) The instructions in each monopoly square are analogous to algorithm instructions stored in the computer memory. Each monopoly square holds one monopoly game instruction. Each computer memory “square” holds one computer algorithm instruction. 3) The player reads the instruction on the square they land on and performs that instruction. The computer reads the instruction on the memory “square” it “lands on” and performs that instruction. 4) The official parker brothers game of monopoly comes with a set of exactly 128 rules and 40 Squares. The computer you will read about in this book has only 8 instructions and 64 memory squares. By comparison, a commercial computer, such as the Intel Pentium 4 Processor, contains hundreds of instructions and millions of squares. The game of monopoly comes with its instructions FIXED into place on the squares of the monopoly board. However, what makes a computer useful, in fact, what makes this computer and ALL computers “programmable”, is that you can place any of these 8 instructions you like in any place on the board (in any memory square) you want. In the remainder of this book, I will describe the design and operation of a simple digital computer that I call the SIMCO, short for simple computer. This chapter will present the operation of the SIMCO as the rules of a board game, the game of “SIMCO”. By learning the rules of this game and following along with the examples, you will learn how to program the SIMCO computer and gain an overview of how the SIMCO follows the programming instructions you place in its memory squares. Learning to Program…Learning the RULES to the game of SIMCO. Read the instruction found in the square you are on. Jump to the next sqaure and repeat these rules, beginning with rule 2. If a square does not contain an instruction, simply jump to the next square and repeat these rules, beginning with rule 2. After you have landed on sqaure 63, the next square to jump to will be square 0. Repeat these instructions beginning with rule 2. Location Counter Register: Keeps track of which square the computer will be jumping to. The instruction register holds the number of the instruction found in the memory square the computer is currently on. Add 2 numbers together and store the result in the accumulator square. For example, the instruction ADD 5 will add the number found in memory square 5 to the value in the accumulator, and then write the sum of these 2 numbers back to the accumulator, overwriting the old value in the accumulator. Subtract one number from another number and store the result in the accumulator square. 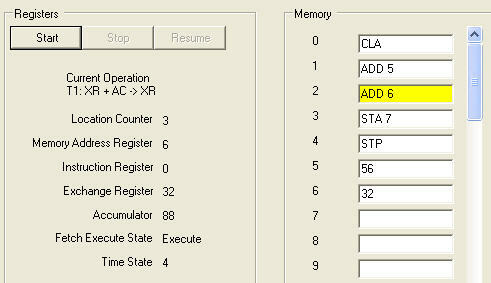 For example, the instruction SUB 5 will subtract the number found in memory square 5 from the value in the accumulator, and then write the difference of these 2 numbers back to the accumulator, overwriting the old value in the accumulator. For example, if you land on a memory square containing the instruction MUL 17, the number in memory square 17 is multiplied by 2 and the result is written to the accumulator square, overwriting whatever number was previously in the accumulator. For example, assuming you land on memory square 17 containing the instruction JMP 8, You must move immediately to memory square 8, skipping over all of the squares in between. “Jump” to a new square ONLY if the accumulator square contains the number 0. For example, if you land on a memory square containing the instruction JZ 45 and the value of the accumulator square is 0, you must immediately move to memory square 45, skipping over all of the square in between. If the number in the accumulator square is not 0, then you simply proceed to the next square as according to rule 4 above. 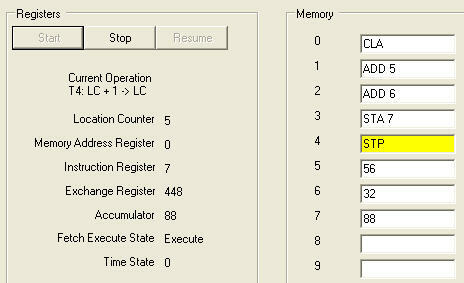 For example, if you land on a memory square containing the instruction STA 32, whatever number is in the accumulator square overwrites the number in memory square 32. Write the number zero to the accumulator. For example, if you land on a memory square containing the instruction CLA, the number 0 gets written to the accumulator square, overwriting whatever number was previously in the accumulator. For example, if you land on a memory square containing the instruction STP, the computer stops following the program and ends. Below is a picture of memory squares 0 to 7 of the 64 memory squares. In memory squares 0 to 4 are instructions. By following the 6 rules of the game of SIMCO above and performing the instructions found in these memory squares, the computer will add the numbers found in memory squares 5 and 6 together and write the sum in memory square 7. The instructions found in memory squares 0 to 4 are called an algorithm, or computer program. 1 The left side of the picture below shows the 5 special register squares mentioned above. 2 The right side of the picture below shows memory squares 0 to 7 of the 64 memory squares. 3 The number to the left of each memory square identifies that square. It is the square’s “address”. 4 The number highlited in yellow is the memory square the computer is currently on. 5 Depicted in each memory squares 0 to 4 are instructions. 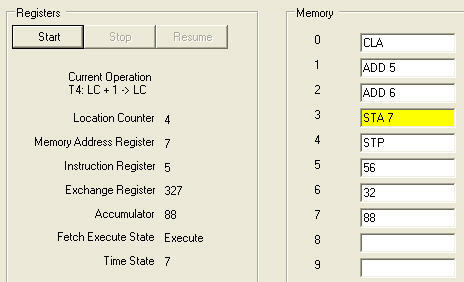 For instance, memory square four contains the instruction STP, which means “stop the program”. Rules 2 and 3) Read the instruction found in the square you are on and Perform the instruction. Rule 2: Read the instruction in the memory square you are on into the instruction Register. Memory square 0 has instruction CLA(“Clear the Accumulator”). CLA is instruction number 6. This instruction number is placed into the instruction register so that the SIMCO knows what instruction it is to perform. In the picture above you see that the number 6, representing instruction CLA, is now in the instruction register. Rule 3: Perform the instruction. 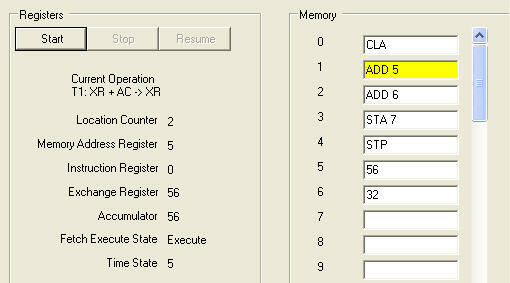 Instruction CLA puts the number 0 into the Accumulator Register. The Location counter register holds the number of the next square to jump to. We are currently on memory square 0, so the next memory square to jump to is square number 1. Rule 4 Jump to the next square and repeat these rules, beginning with rule 2. Rule 4: The SIMCO was on square 0, so now it jumps to the next sqaure, square 1. The Location counter ALWAYS holds the value of the next square to jump to. Rule 2: Read the instruction in the memory square you are on and place it into the instruction Register. Memory square 1 has instruction ADD 5. ADD is instruction number 0, so 0 is placed into the instruction register. 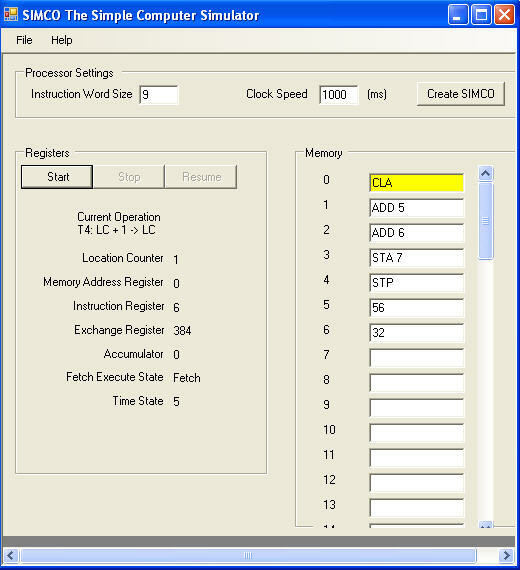 This instruction tells the SIMCO to add the value at memory square 5 to the value in the Accumulator. 5 has the value 56 in it. 0 + 56 = 56. This sum, 56, is written to the Accumulator, as depicted above. Rule 4: Jump to the next sqaure and repeat these rules, beginning with rule 2. Rule 4: The SIMCO was on square 1, so now it jumps to the next sqaure, square 2. The Location counter is incremented to hold the value of the next square to jump to. Rule 2: Read the instruction in the memory square you are on into the instruction Register. Memory square 2 has instruction ADD 6. ADD is instruction number 0, so this is written to the instruction register. 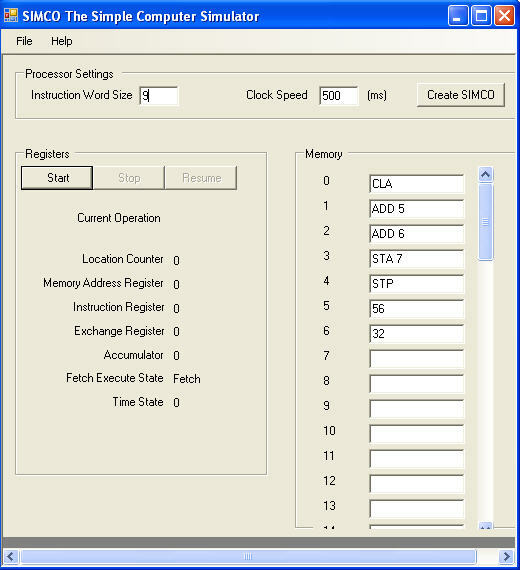 This instruction tells the SIMCO to add the value at memory square 6 to the value in the Accumulator. 6 has the value 32 in it. 56 + 32 = 88. This sum, 88, is written to the Accumulator. Rule 4) The SIMCO was on square 2, so now it jumps to the next sqaure, square 3. The Location counter is incremented to hold the value of the next square to jump to, which will be square 4. Rule 2) Read the instruction in the memory square you are on into the instruction Register. Memory square 3 has instruction STA. STA is instruction number 5, so 5 is written to the instruction register. This instruction tells the SIMCO to STore (Write) the value in the Accumulator to memory square 7. Rule 3)Perform the instruction. The Accumulator has the value 88 in it. This value is written to memory square 7, as shown in the picture above. Rule 4) Jump to the next sqaure and repeat these rules, beginning with rule 2. Rule 4) The SIMCO was on square 3, so now it jumps to the next sqaure, square 4. The Location counter is incremented to hold the value of the next square to jump to, which will be square 5. No longer jump to new memory squares and perform the instructions in them. Location 7 now has the value 88 in it, which is the sum of 32 and 56.
;A program to endlessly add the number 1 to itself. 4 JMP 1 ;jump back to memory square 1, starting the process all over again. 5 0;the result of the addition is written at memory square 5. Memory square 5 initially has a value of 0 in it. A program to multiply two numbers together. ;repeatedly adding the number 7, found at memory address 30, to memory square 31. After 5 such additions, the program stops. 2 ADD 31 ;memory square 31 is where the result of the multiplication will be stored. It might not seem at this point that you can do very much with these 8 instructions and 6 rules. After all, the computer programs listed above only perform menial arithmetic operations. By comparison, modern computers and software can do everything from automating factories to surfing the internet. However, an amazing fact about computers is that what one programmable computer can do, any programmable computer can do given enough time and memory. The person who made this discovery is Alan Turing, who was one of the primary inventors of the modern day digital computer. The idea is called the theory of the Universal Computer.